Playa Maguey is 1/4-mile long beach southwest of Santa Cruz, accessible by boat and land, calm waves on the east end, moderate on the west end. Good swimming and snorkeling. Further out, Punta Maguey is a good scuba diving site with walls and caves. 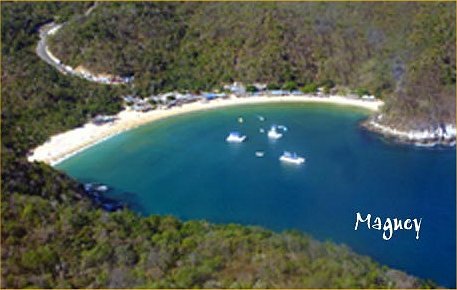 To drive to Maguey, take the road to Playa La Entrega. The road winds up to a hilltop then descends to the beaches. You take a right (unmarked) fork to reach Maguey, 4 kms (12/99).